Eligible Candidates can Download Group D Exam Admit Card at the Official Website of HSSC. 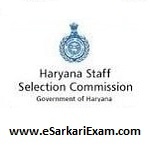 Applicants First Log on to Haryana SSC Official Website. Open Advertisement 04/2018 Group D Link.